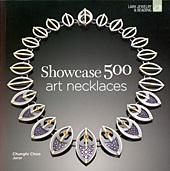 NEWS - We are honored to be featured in this edition of Showcase 500 art necklaces... on the 12th page! Contact us to find out how to receive your very own copy autographed by Pandora. All the contents of this web page and jewelry designs are © 2016 Pandora&Pendragon. All Rights Reserved.